A MUST HAVE APP by NY Times, USA Today, Lifehacker. Over 20 million people rely on Any.do to stay organized and GET MORE DONE! It’s the simplest most powerful to-do list, calendar & reminders in one app. SYNC SEAMLESSLY in real time between your mobile, desktop, web and tablet. GET REMINDERS for a scheduled time or when you reach a particular location, so you never forget a thing. EASILY VIEW your events and tasks for the day, week, or month. SYNC SEAMLESSLY with your phone’s calendar and your facebook events, so you don’t miss anything. QUICKLY SCHEDULE MEETINGS with smart calendar coordination with your colleague’s schedule. FOLLOW UP WITH TASKS after a meeting, while it’s still fresh in your head. …and much much more, so you don’t have to. THE ASSISTANT SAVES YOU TIME FOR THE THINGS THAT MATTER, like being with your family or even reading a book! FOCUS with a daily Moment to prioritize tasks for today, tomorrow, and someday. QUICK-ADD tasks by voice, with our smart auto-suggest, by email, or through integrations with Alexa and more. BE DETAILED by attaching sub-tasks, notes, and files, including from Dropbox or Google Drive (Gdrive). TAKE NOTES whenever you get an idea for a to-do, a book to read, or a vacation to take. 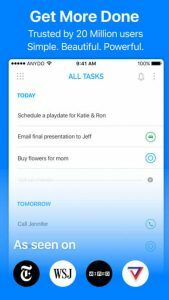 Get the productivity boost you’re looking for in a single app which combines a calendar, to-do list, and a smart assistant who’ll do tasks for you so you don’t have to. Getting Things Done (GTD) has never been easier! Use it for home life, work life, and anything in between. People use Any.do as a calendar, reminders, task list, checklist, a notepad, a board for sticky notes, a project management tool for small teams, a daily planner, day scheduler, and much much more to reach their goals. Best of all, this life manager is free for basic use! Any.do’s basic to-do list + calendar is free to download and use. Any.do Premium upgrades your experience and gives you unlimited access to the Any.do daily moment, themes, files and collaboration to help you accomplish even more for $2.99 a month or $26.99 a year through an auto-renewing subscription. The Assistant service has a 10-15% service fee in addition to the cost of completing your to-do list task. It’s rolling out now, so if you want to get on the waitlist early, just go to sign up in the app. I’ve been looking forever for a todo list/calendar app with the Plan My Day feature and for that I’m giving this 5 stars. I do have a couple features I would love to see added though. In the Plan My Day screen, I want to be able to drag events to reschedule and expand time length just like with tasks. I would also like to see the repeating tasks expanded so that I can choose the number of times per week as opposed to just the days of the week. For example, read 5 days/week and go to the gym 3 days/week. Once you hit the goal number, they no longer appear in Plan My Day until the next week. Add those in and this will be my absolute favorite app! The app is pretty helpful. The major concern I have is slow update of a completed or added task which is shared with users. When I send my team out for a mission, I need a fast response from my team to ensure a task is complete before another task is assigned. Due to the slow update, it hinders productivity.